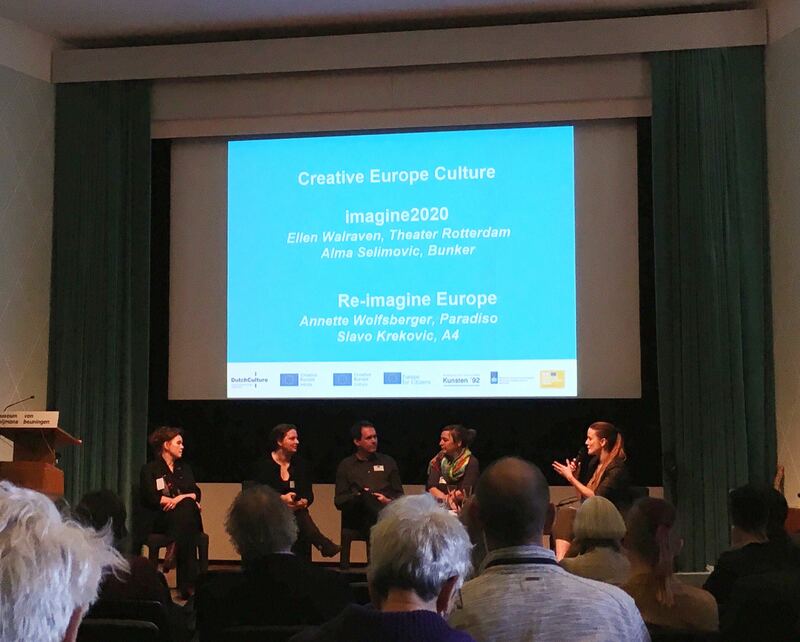 During Europadag 2018, Re-Imagine Europe / Paradiso Amsterdam’s Annette Wolfsberger and Slavo Krekovic (A4/SK) alongside Imagine 2020’s Ellen Walraven (Theater Rotterdam/NL) and Alma Selimovic (Bunker/SI) shared their experiences of East-West collaboration in the context of European-wide cooperation projects. Within projects where a wide range of partners share common artistic values but differ in size, organisational structure and budget – and which all operate under different local realities – imbalances are bound to arise. The panel discussed how such potential imbalances can be signaled, addressed and dealt with. The panelists proposed not to ignore cultural differences or issues of structural geographical and financial imbalance but address them within the projects through solidarity. EC projects are a possibility for widening work fields and horizons – also geographically – and organisations can use them to extend their working areas into new territories rather than being held back by a dichotomous view of Eastern and Western Europe. Europadag 2018 was an event hosted by DutchCulture centre for international cooperation / Creative Europe Desk NL. The theme is working “beyond the comfort zone” by looking eastwards in cultural cooperation.